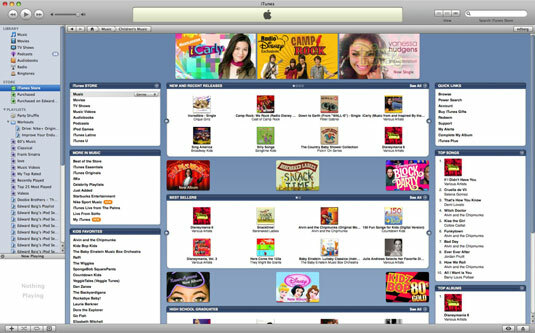 Search: A great starting point is to search for artists or song titles by entering the name in the Search iTunes Store box near the upper-right corner of the screen. You can put more weight behind your search by clicking Power Search inside the Quick Links list, which lets you search by several parameters simultaneously (song, artist, album, genre, and composer). Browse: If you’re not starting out with a particular artist in mind, click Browse from the Quick Links list. You see a window such as the one shown in the following figure. 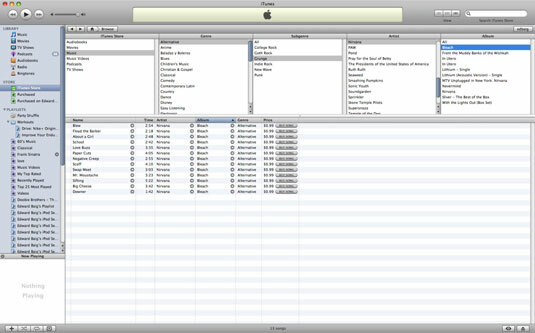 Choose whether you’re searching for an audiobook, a movie, music, a music video, a podcast, or a TV show in the leftmost column and then select a genre in the column to its right, a subgenre in the next column, and so on, until you’ve narrowed the list to tunes you want to own. Top Songs: If you happen upon an album page but aren’t familiar with the performer’s music, consult the Top Songs list and click to hear your 30-second sample. You can also sample Top Ringtones, if available. Listeners also bought: If you’re impressed by what you hear from a given artist, you may also be attracted to other music purchased by fans of the artist’s work. Hobnob with the stars: An eclectic cast of the rich and famous — Liv Tyler, Madonna, Mike Myers, William Shatner, Kim Cattrall, Bill Maher, Billy Bob Thornton, Carole King, B.B. King, Nicole Kidman, Russell Crowe, Jennifer Garner, Taye Diggs, Jackie Chan, Smokey Robinson, RuPaul, Andrew Lloyd Webber, Kanye West, Sting, Al Franken, Lance Armstrong, the Reverend Al Green, and many more — have put together lists of their favorite works. The artists usually provide brief descriptions of why they chose certain songs.